The Zoom H6 Handy Recorder with Interchangeable Microphone System and Waterproof Case Kit from B&H includes an H6 recorder, an XYH-6 X/Y microphone capsule, an MSH-6 mid-side microphone capsule, a 2GB SD card, four AA batteries, a foam windscreen, and an SKB iSeries waterproof case. It is well suited for transporting and protecting your H6 recorder and accessories when working in the field, on live recordings, video, live broadcast, or electronic news gathering projects. The H6 handy recorder is a versatile, six-track, portable recorder with four mic/line inputs. It doubles as a USB interface and features an interchangeable microphone system with six interchangeable capsules (two included, four available separately), which can be swapped out as easily as the lenses of a camera. Specifically designed for the Zoom H6, the SKB iSeries military-standard, waterproof hard case offers your recorder protection against water submersion, impact, corrosion, and fungus. It fits the H6, the XYH-6 and MSH-6 capsules, and various small accessories. The H6 Handy from Zoom is a portable handheld recorder and USB audio interface that features an interchangeable microphone system. 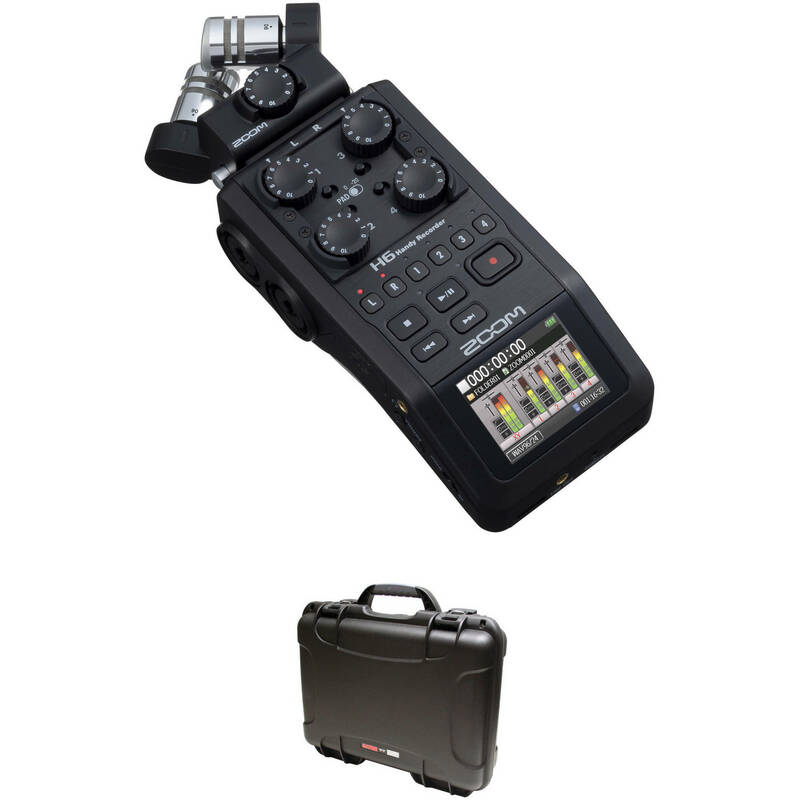 The recorder ships with both XY and mid-side microphone modules, foam windscreen, four AA batteries, USB cable, Cubase LE and a hard carrying case. Optional module attachments can be purchased for expanded functionality. The H6 Handy allows for versatile recording techniques, giving you several options right out of the box. The included XYH-6 XY microphone module is made up of two matched unidirectional condenser microphones and is intended for capturing accurate, phase-correct stereo audio. The module allows you to adjust the angle of the two mics to either 90 degrees, or for a wider stereo image, 120 degrees. For situations that call for audio that allows for width control over your stereo image after it has been recorded, the XY module can be switched out for the MSH-6 mid-side stereo microphone module. Contrary to the appearance of the capsule, the mid-side module actually contains two elements positioned on top of one another: a unidirectional mic which faces forward (mid), and a bi-directional mic set perpendicular to it (side). In addition to providing you the ability to adjust the width of your stereo audio after it has been recorded, MS recording also provides true mono compatibility, a factor that comes into play in situations such as television production. In addition, the H6 is equipped with four XLR/TRS combo inputs for connecting external mic/line sources such as microphones or mixers. All four inputs and each of the mic modules are equipped with their own preamps with dedicated gain knobs that are easily accessible whether you have the unit mounted to your camera, or strapped over your shoulder. Also, each of the four combo inputs has its own -20dB pad. The recorder allows you to record up to six channels at once and stores them to SDXC memory cards up to 128GB in size. It also features a backup-record option that tracks a duplicate of the left and right channels with -12db input gain. This means that if you find that you have tracked your main audio too loud and that distortion has occurred in your audio, you will have a backup stereo mix with 12 db more headroom as a fail-safe. The unit also doubles as a 6-in/2-out USB audio interface and it can be used with your computer running the included Cubase LE or other DAW software. The iSeries Waterproof Case for Zoom H6 from SKB is built to perfectly fit the Zoom H6 recorder and its included XYH-6 X/Y and MSH-6 MS microphone capsules. It also fits memory cards, cables, and additional accessories. Intended to protect your valuable gear from weather, impact, corrosion and fungus, this case is injection-molded, constructed of ultra high-strength polypropylene copolymer resin and features a gasketed, waterproof, submersible design. It also features custom durable PE foam that's been specifically shaped for the H6 and its components. Additionally, this case has a trigger-release latch system, a snap-down rubber over-molded cushion grip handle and an automatic ambient pressure equalization valve. Box Dimensions (LxWxH) 10.7 x 8.25 x 3.4"
Box Dimensions (LxWxH) 11.4 x 10.1 x 5.1"
H6 Handy Recorder with Interchangeable Microphone System and Waterproof Case Kit is rated 5.0 out of 5 by 1. Rated 5 out of 5 by Russo from Works like a charm! This little recorder packs a lot into a compact design. The sound is really clean and the digital meters are sweet! The mic attachments are a real plus but connecting a boom with an XRL cable is what I really like. And the unit is pretty durable.